The church was fairly substantial, built to accommodate up to 350 Sandgate residents and holidaymakers. It cost £1300 to build, and was topped with a tall spire that needed to be erected by a specialist steeplejack. Because of its size, it was also used as a community meeting hall, and the local Freemasons also used it for their lodge meetings for almost 30 years. The fine building still stands, and although it is no longer a church, it still serves the community as a childcare centre. 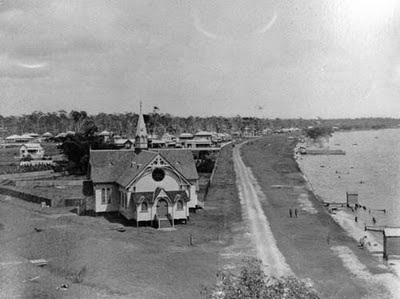 The Esplanade is now called Flinders Parade; the bathing huts are no more; but the area is still a haven for relaxation. The building is in terrific order (click the picture to see a larger image), and it is a tribute to Richard Gailey and the early Baptists of Sandgate. I realise bathing pavilions are not the main focus of your post, but I have never heard of pavilions in Brisbane before. I must have led a narrow Melbourne- and Sydney-centric life. Do you have ESP? I have a couple coming up shortly! 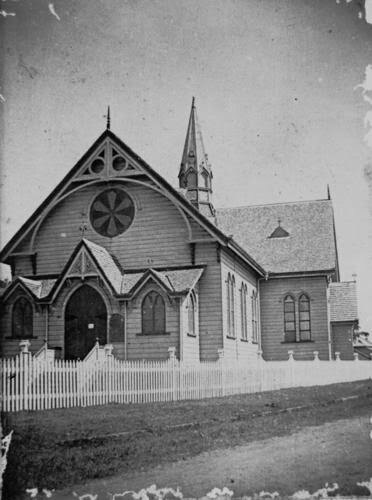 The new Sandgate chapel opened and held its first service on Christmas Day in 1887 not 1877. Thanks for noticing that typo. Now corrected. I think you will find the amalgamation of Sandgate and other Surburban Councils into the Greater Brisbane Council took place in 1925. Sandgate Town Council were still having meetings up until that time. Otherwise, very accurate.